Stunning six-armed chandelier featuring opaline glass lamps with elegantly shaped red brass shades and a black metal frame. Beautifully crafted and detailed. We think it’s a Stilnovo based on the design and construction methods used but we have not been able to confirm this definitively. Minimum price for the offer must be greater than 1645% of the Product. Four beautiful Arrben chairs. Model Sultana in dark blue saddle leather on a chromed steel frame. Top quality stack able Italian chairs from the 1980s. Industrial desk chair. Designed by Albert Stoll for Giroflex, Switzerland. Very well designed chair. Bent steel with the original mustard yellow upholstery from the 1970s. 1970s Italian Harvey Guzzini design pendant lamp, bicolored plexiglas combination. Fantastic chandelier of gilded brass and crystal glass by Palwa, Germany, 1960s. Measures: 67cm (26 in.) diameter, total height 60 cm. 15 x bulbs with an E 14 socket. Excellent condition. Worldwide shipping. Big brass pendant. designed by Hans-Agne Jakobsson . Produced by Markaryd in Sweden. Brushed brass finish outside, painted white inside. Very nice state. Dimensions: Height 40cm; Diameter 38 cm. 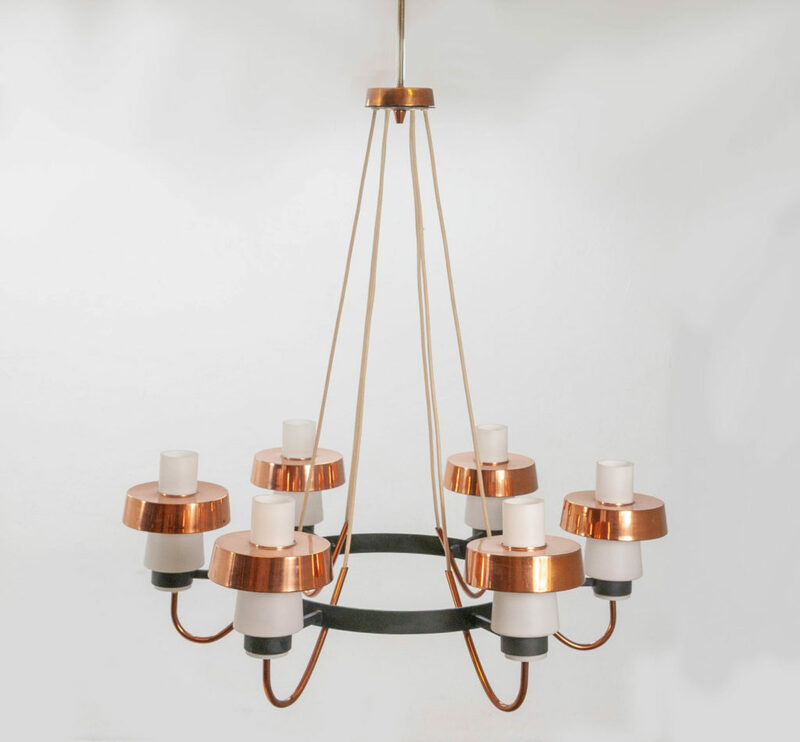 Beautiful mid century Pendant light designed by Harvey Guzzini in the 1960s and manufactured by iGuzzini in Italy. It is made from white Plexiglas and aluminium. The lamp remains in a very good vintage condition.